The industry experts at Fab-Seal Industrial Liners, Inc. offer holding tank drop-in liners that are installed with little preparation. Drop-in liners from Fab-Seal are test-proven to be the easiest method for containing harsh and dangerous chemicals. These plating and metal finishing liners provide quick, cost-effective solutions for leaking holding tanks. Call 800-874-0166 today to speak with one of our knowledgeable representatives. Trust the industry experts at Fab-Seal Industrial Liners, Inc. to supply drop-in liners for your holding tank needs. Fab-Seal Industrial Liners, Inc. makes premium quality drop-in liners in our factory as a one-piece unit. Plating and metal finishing drop-in liners are constructed for a rope to hold it in place in a holding tank, or stainless clips to attach to the lip of the holding tank. The drop-in liners from Fab-Seal are structurally supported by holding tank walls. 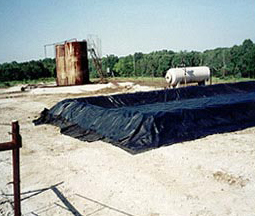 They are flexible, non-metallic, heavy-duty Fab-Seal drop-in liners are a proven remedy for leaking holding tanks and secondary containment areas. No job is too large or too small for the industrial liner experts at Fab-Seal Industrial Liners, Inc. Drop-in liners for holding tank containment are available to fit your application or job. Fab-Seal Industrial Liners, Inc. has spent over three decades building a valued reputation in the industry. A trusted manufacturer and installer of drop-in liners, we have what you need for a wide range of industrial uses and applications. Call 800-874-0166 to speak with one of our knowledgeable representatives today. Trust the industry experts at Fab-Seal Industrial Liners, Inc. to supply a drop-in liner for your holding tank containment needs. Or click the Request a Quote button to the right and we will respond to your inquiry shortly. Have a question about Drop-In Liners?